State and federal investigators are working to determine how and why the five-day-old span failed on Thursday. Two workers were on the 950-ton bridge when it pancaked on top of vehicles waiting at a stoplight. 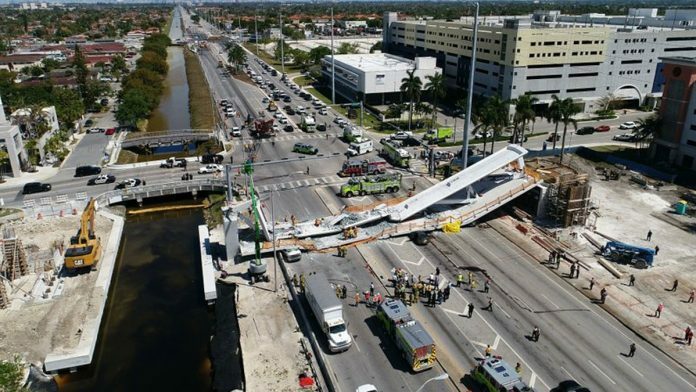 An innovative pedestrian bridge being built at Florida International University had been put to a “stress test” and its cables were being tightened when it collapsed over traffic, killing six people and sending 10 to a hospital, authorities said. Sen. Marco Rubio tweeted late Thursday that the cables that suspend the bridge had loosened and the engineering firm ordered that they be tightened. “They were being tightened when it collapsed,” he said on Twitter. Police confirmed Friday morning that at least six people are confirmed dead in the collapse of a pedestrian bridge near Miami. Crews are now conducting a search and recovery operation, looking for more victims. Figg’s statement Thursday said the company was “stunned” by the collapse and would cooperate with investigations. Robert Bea, a professor of engineering and construction management at the University of California, Berkeley, said it was too early to know exactly what happened, but the decision to use what the bridge builders called an “innovative installation” over a heavily traveled thoroughfare was risky. The FIU community, along with Sweetwater and county officials, held a “bridge watch party” on March 10 when the span was lifted from its temporary supports, rotated 90 degrees and lowered into what was supposed to be its permanent position.